Within just 70 years Turkey has gone from a place with a tangled history to a holiday hotspot. The geo-polictical upheavals of the 1920s forced tens of thousands of Muslims to leave their homes in Greece. Travelling by cart, freighter and camel, they arrived here to rebuild a life. Many ancient civilisations, from the Lydians to the Persians, Romans and Byzantines, have seen their empires rise and fall here. It is this history that today, draws millions of tourists to these shores. Thanks to Turkey's modern economy, carts and camels play no part in my own journey. Instead I take a comfortable five-hour Turkish Airlines flight from Delhi via Istanbul to Izmir. I head out to explore the city after checking in at the shorefront Crowne Plaza Hotel. There's an aroma of fresh coffee and tomatoes in the air, drying laundry gently falp in the cool wind on the rooftops, the sun is balmy and the setting is of a rather sleepy afternoon. Izmir may be home to four million inhabitants but it has a certain quaint quality to it. The city sits just a few feet above the deep blue Aegean Sea. Behind it, the Madra mountains form a lush backdrop. It's no wonder then that these settings inspired Homer to pen The Iliad-it was first recounted on the banks of the nearby Meles, between 750 and 700 BC- and even encouraged Alexander the Great to take a break from his many conquests. May be that is why the Turks call this place "guzel". The word means beautiful. It really is. At the city centre, the palm-lined Kordon promenade bustles with bars, restaurants and cafes that send the delicious smell of spices, coffee and shisha wafting through the air. It is no accident that the promenade faces West; perfect to catch the sunset. The impressive Konak pier, with its many yachts was designed in 1890 by the same Gustave Eiffel who, just the year before, had built Paris' Eiffel Tower. I take a seat at an al-fresco restaurant, Firinci Cafe, on Passaport quay and order a coffee. There is an enthusiastic, almost festive, character to this part of town. The coffee arrives in a tiny cup. It holds a rich, muddy concoction. Turkish coffee is prepared by boiling finely-powdered, roasted beans in a cezve, or pot. The coffee is left to settle into a thick, strong, sludge. Ahmet Maqsood, my steward, tells me most drinkers only manage four or five sips before the dregs at the bottom become too bitter to finish. To the Turks, coffee is a potent aphrodisiac. In fact, years ago, you could even divorce your spouse if they refused to drink it. The next day, I set off on my journey from Izmir to Smyrna, the legendary city of the Amazons- the warrior womenfolk of Greek mythology. Legend has it that the Goddess Nemesis visited Alexander the Great in a dream when he stopped to rest on Mt Pagus, just outside the city walls. Nemesis ordered the city be moved to the hillside, where modernday Izmir stands. No reason was given; at least none was recorded. However, the Oracle of Claros is said to have predicted that Smyrna's citizens would be four times happier if they made the shift. The Oracle was right. The city prospered thanks to its fortuitous location along important trade routes. Strabo, the ancient geographer, once wrote that Izmir was the most beautiful Ionian city, even rivalling nearby Ephesus, which is my next stop. Ephesus hints at what Smyrna would have looked like in ancient times. It was the capital of the Asian arm of the Roman Empire and was home to 200,000 people. Although only partially excavated, Ephesus is a fascinating reminder of how advanced these ancient cultures were. I arrive on a busy morning. 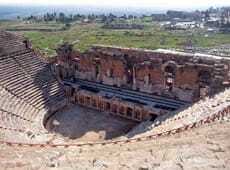 Ephesus' bone-white ruins attract scores of tourists. They may be dressed in jeans and hats but I can't help but imagine that this is what the city's busy streets would have seemed like in the first century AD. At dusk, I return to my hotel after my time-travelling adventure. A guide book from the concierge helps me navigate the labyrinth of Ottoman and Roman history. The next day, Sirince (meaning 'pretty' in Turkish) awaits a visit. 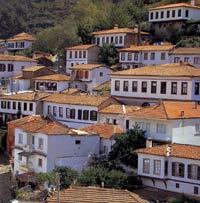 This tiny village perched atop a hill is a perfect synthesis of pre-1920 Turkic-Greek culture. The town is famous for olives. In fact, the world's oldest olive oil workshop is just 20 kilometres away in the fishing village of Urla, which dates back to 4000 BC. 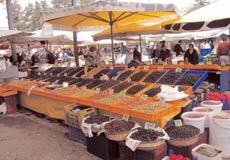 Aubergines, peppers, mulberry, pomegranate, figs, and pumpkin are also staples here. On my last night in Izmir, my guide Gulgun promises a sensory treat. Like most things in Izmir, the restaurant she takes me to also has a backstory. 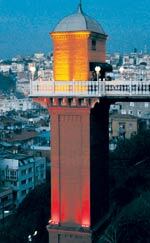 Asansor (meaning elevator) is housed at the top of a 40-metre tower that was built in 1907. A local philanthropist funded the entire project because he wanted to connect Izmir's downtown Halil Rifat Pasha district with the hillside Karatap area. The restaurant that sits on the hillside offers a stellar view of Izmir, and all the way down to the twinkling lights of boats on the Aegean. Izmir is about 560km from Istanbul. A drive down would take at least eight hours although the views are captivating. An easier option is to take a Turkish Airlines connecting flight from Istanbul to Izmir. 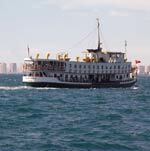 The Konak pier in Izmir is more than 120 years old and offers great views of the sea. Ephesus and Sirince are good options to experience how the architecture and history of this region has evolved. The Crowne Plaza Hotel in Izmir offers twin-occupancy with a sea view for Rs 7,429 a night, excluding taxes. Despite its location in the Asian part of Turkey, Izmir's cuisine has a distinctive European flavour. I order some grilled sea-bass and squid cooked in vine leaves. For that middleeastern flavour, I add some kofte. Each dish is light and fresh. For dessert the kitchen sends us an assortment of quintessential Turkish sweets- bakhlavas and lukums-in more varieties than you can possibly chew. Izmir, like Turkey itself, is at the crossroads of civilisations. It is the east of the west and the west of the east, where culture, religion and mysticism gather and fuse into an elaborate tapestry. Mosques, synagogues and churches, thriving across the city, are testament to an atmosphere of tolerance. I pack many souvenirs-from bottles of olive oil and pomegranate extract, to little 'evil eye' key rings. I want to take back as much of this beautiful city with me as I can. Izmir, with its gentle gait and vivacious personality remains in my thoughts long after my flight has taken off.